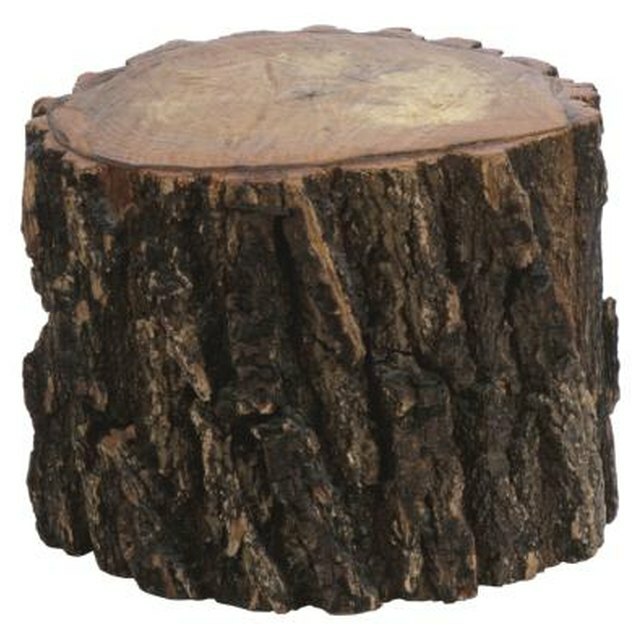 A tree trunk table base can be made by the do-it-yourselfer with little or no experience. Making a table base from a tree trunk saves trees. Additionally, by using a tree trunk, you can recreate an old, antiquated piece of furniture that appears rustic and used. Expect to complete this process in one to two days, depending on the size and scope of the project. Old tree trunks make great table bases. Cut the bottom of the tree trunk where the roots extend with a chainsaw, leaving as much of the protruding roots as possible. However, cut enough off, as well, to obtain a flat, solid surface that is at least 48 inches in diameter. Measure up from the bottom of the flat cut a distance of 40 inches, and place a pencil mark. Cut the trunk off at 40 inches with the chainsaw. Although 40 inches will not be the final height, you will need at least 4 to 6 inches of extra trunk to allow for grinding and sanding. Grind the bottom of the trunk with a right-angle grinder fitted with a 12-inch, 60-grit sanding disc. Wear a dust mask and eye goggles before proceeding, however. Test the trunk by placing it on a hard, level surface. Alternate between sanding and leveling to achieve a level tree trunk base. Paint the tree trunk bottom with black spray paint and let the paint dry. Spin the tree trunk on the floor. Grind any areas where the paint has been removed. Place the tree trunk upright with the bottom on a flat, hard surface. Measure from the bottom to the top 36 inches and place a pencil mark. Grind the top down with a right-angle grinder down to within 1/4 inch of the pencil mark. Paint the top with black paint and repeat the spinning proceed to remove paint at the high spots. Grind the high spots down and test the tree trunk top on a flat, hard surface. Sand the top and bottom with 60-grit sandpaper and an orbital sander. Brush the sides of the tree trunk to remove any loose bark, and apply three coats of gloss clear coat. Spray on the clear coat, allowing 30 minutes drying time between coats. If you want a bare wood tree trunk, remove the bark completely before applying the clear coat.